The cruciferous family of vegetables includes cabbage and its many relatives (bok choy, kale, Brussels sprouts, broccoli, cauliflower). A cultivar of the Brassica family, cabbage comes from caput, the Latin word for "head" (hence the expression: "a head of cabbage"). Wild cabbage, from which all other cabbage varieties originate, is native to the Mediterranean and was domesticated nearly 2,500 years ago. It grew in popularity across northern Europe for its ability to grow and store well in cool climates. Today, cabbage is enjoyed in many forms and preparations throughout the world, from American coleslaw to fermented German sauerkraut and Korean kimchi. Like onions, some cabbages have a strong, even pungent taste. In onions, these flavors come from stored molecular compounds that release sulfur upon cell damage. When cabbage plants are damaged by cutting or chewing, glucosinolates, the stored, flavor precursors in cabbage, release both sulfur and nitrogen. At the same time, enzymes transform glucosinolates into isothiocyanates, which are responsible for the slight bitterness of raw cabbage. Different cabbage plant types (cabbage, Brussels sprouts, broccoli etc.) have different glucosinolate precursors and therefore different flavors. In cruciferous vegetables, glucosinolates are important for flavor but also as potent chemo-preventive and anti-angiogenic agents. 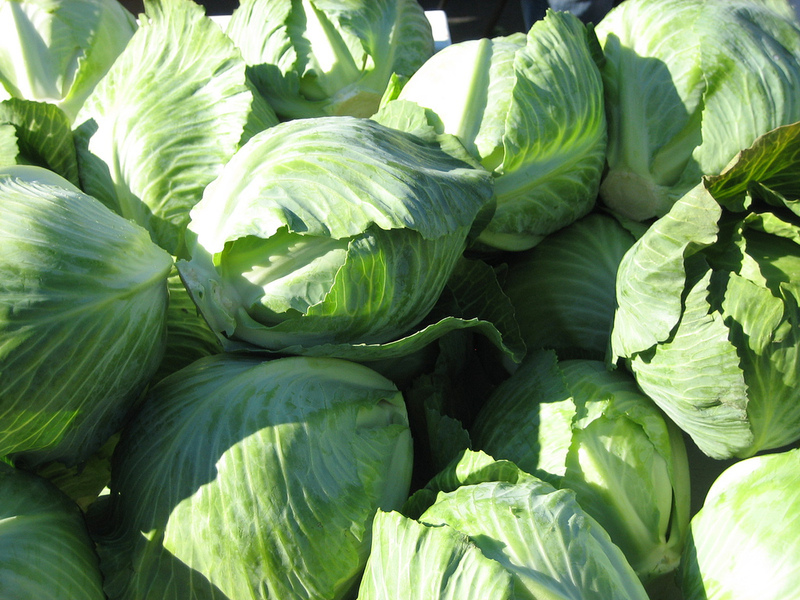 Cabbage is an annual cold-season crop because it is resistant to frost. The cabbage plant has a short stem with a crowded mass of leaves. Only the leaves are normally eatan, which are widely consumed raw, cooked, or preserved. There are many varieties of cabbages in cultivation, including dark green, white, savoy, and purple varieties. Some have tight, nested "heads" of leaves (these are sweeter and store well) while others are open-leaved (these have higher concentrations of vitamins A and C). The most common cabbage in the US is 'White Cabbage', which itself has many varieties. Chinese cabbage is a distinct species (Brassica chinensis or boy choy; Brassica pekinensis or Napa cabbage). Raw cabbage can be shredded and used in fresh salads and sandwiches, vegetables juices, or coleslaw. Fermented cabbage forms the base of sauerkraut and spicy kimchi dishes. Cabbage is also used to make soup bases and vegetable stocks. Headed cabbages should be selected for crisp, tightly packed leaves attached closely to the stem. They should be dense and firm to the touch. Cabbage leaves often have a powdery waxy coating called "bloom". The goal of storage is to slow down its respiration by low temperature and minimizing exposure to the air. Whole, un-cut heads can remain in the refrigerator for up to 2 weeks. After cabbage is cut, it should be wrapped tightly in plastic wrap and used within a few days. Growing conditions can affect the concentrations of glucosinolates, the strong, flavor precursors in cabbage plants. Warm, dry climates increase glucosinolates, so winter cabbages are best for milder flavors,. In addition, chopping cabbage increases the actual concentration of glucosinolates and facilitates the transformation of glucosinolates into isothiocyanate precursors. Combining cabbage with acidic sauces like vinegar can similarly increase glucosinolate concentrations. In contrast, soaking cabbage in water removes isothiocyanates and reduces flavor. Cabbage and its relatives are vegetables that demonstrate cancer-fighting properties. Glucosinolates, a mustard oil glycoside in contained within cruciferous vegtables. The enzyme myrosinase, which is stored in a separate compartment of the plant cell, is liberated when the plant is crushed or chewed. Myrosinase converts glucosinolates to the bioactive molecules isothiocyanate and indole-3-carbinol, which are both antiangiogenic. Sulforaphane, is a type of isothiocyanate and has been demonstrated to inhibit multiple pathways in tumor angiogenesis. Many studies consistently show that a high intake of cruciferous vegetables is correlated with reduced risks of developing many cancers, including those of the breast, lung, colorectal, and non-Hodgkin’s lymphoma (NHL). The cancer-fighting compounds in cabbage and other cruciferous vegetables are glucosinolates and their products. These include isothiocyanates and indole-3-carbinol (I3C). One particular isothiocyanate in cabbage, benzyl isothiocyanate (BITC), has been shown effective against breast, lung, and liver cancer cells in vitro. When administered as a drug to mice with human breast cancer cells, BITC reduced both angiogenesis (by reducing levels of pro-angiogenic vascular endothelial growth factor, VEGF) and tumor size (through cell self-suicide, or apoptosis). Napa cabbage is not named after Napa Valley, California but rather the Japanese word "nappa" which refers to edible vegetable leaves. Kimchi, the Korean fermented cabbage dish, suppresses H5N1 avian influenza (bird flu) according to scientists at Seoul National University who successfully treated infected chickens with kimchi. Korea's claim of being SARS-free is also often attributed to its population's ingestion of kimchi. One head of green cabbage generally weighs 2.5 lbs and yields 9 cups of shredded cabbage raw or 7 cups cooked. Cabbage releases an unpleasant sulfuric smell with prolonged cooking due to breakdown of isothiocyanate; this odor actually doubles when cooking from 5 to as little as 7 minutes. Therefore cabbage should be cooked for 4 minutes or less. Chopping and storing white cabbage for 48 hours increases the levels of glucosinolates by nearly 15 times. Boiling destroys the anticancer properties of cabbage. Steaming is the optimal method to preserve and can even increase anti-cancer, glucosinolate activity in brassica vegetables. It can be up to two times more effective in preserving glucosinolate activity than boiling or microwaving. Somewhere recently I read that cabbage loses almost all of its nutritional and cancer-fighting value within minutes of being shredded. This link points to an article but is not as comprehensive as what I have seen http://chestofbooks.com/health/natural-cure/The-Hygienic-System-Orthotrophy/What-Is-A-Salad.html. This next link confirms loss of glucosinolates in cooking but espouses kim-chi and sauerkraut because of the culturing with vinegar http://www.getting-started-with-healthy-eating.com/brassica-vegetables.html. My take from most of what I have read is to eat cruciferous vegs raw or lightly steamed and if they must be diced or shredded it should be done freshly as they are served.